The tomato is the world’s most popular fruit. And yes, just like the brinjal and the pumpkin, botanically speaking it is a fruit, not a vegetable. More than 60 million tons of tomatoes are produced per year, 16 million tons more than the second most popular fruit, the banana. Apples are the third most popular (36 million tons), then oranges (34 million tons) and watermelons (22 million tons). Tomatoes are rich in vitamins A and C and fibre, and are cholesterol free. An average size tomato (148 gram, or 5 oz) boasts only 35 calories. Furthermore, new medical research suggests that the consumption of lycopene – the stuff that makes tomatoes red – may prevent cancer. Lycopene is part of the family of pigments called carotenoids, which are natural compounds that create the colours of fruits and vegetables. For example, beta carotene is the orange pigment in carrots. As with essential amino acids, they are not produced by the human body. Lycopene us the most powerful antioxidant in the carotenoid family and, with vitamins C and E, protect us from the free radicals that degrade many parts of the body. 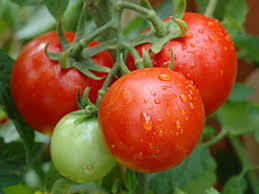 The scientific term for the common tomato is lycopersicon lycopersicum, which mean “wolf peach.” It is a cousin of the eggplant, red pepper, ground cherry, potato, and the highly toxic belladonna, also known as the nightshade or solanaccae. There are more than 10,000 varieties of tomatoes. Tomatoes are used in many food product, including, of course, tomato sauce (ketchup), pasta and pizza. According to a Steel Packing Council survey of 1997, 68% of chefs use canned tomatoes for convenience, quality and flavouring. It hasn’t changed much since. Scientists have found a substance in tomatoes that can help prevent heart attacks and strokes. It works by helping to stop blood becoming sticky and forming the clots that can cause potentially fatal blockages in arteries and veins. The lycopene which gives tomatoes their red colour is known to protect against various cancers. The anti-clotting properties are found in the yellow fluid surrounding the seeds. It was found that the stickiness of platelets – the particles in blood that cause clotting – was reduced by 70 per cent when 220 volunteers had a drink containing the tomato extract. Blood platelets are vital for helping wounds heal after an accident or surgery, but if they become too sticky, then they bind together, which can stop the free flow of blood. The tomato substance reduces the stickiness of platelets so they flow smoothly through blood vessels, reducing the risk of a blockage occurring. Up to 50,000 people a year die as a result of clots caused by a buildup of platelets. Those most at risk are people who have already had a heart attack or stroke, smokers, women on the Pill, long-distance air travellers, the long-term sick and pregnant women. Research has shown that the anti-clotting substance in the drink has no detrimental effect on the natural clotting process. Nor does it cause the side-effects, such as gastric problems, often associated with blood-thinning drugs.